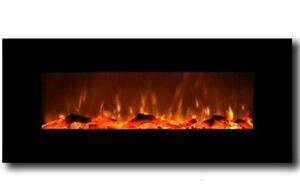 Details about Wall Mounted LED Electric Fireplace 50" / Foyer Mural électrique à DEL 50"
Wall Mounted LED Electric Fireplace 50" / Foyer Mural électrique à DEL 50"
There are 195 items available. Please enter a number less than or equal to 195. Immediate payment of C $233.99 is required. I like the fireplace. It looks fairly realistic. A couple pieces came bent, and the mounting hardware was junk. I got some proper wall anchors from the hardware store and used them instead. Overall it was well worth the price. It doesn't work properly at the 1500W setting, it just stops working after a minute or two and doesn't work at all for quite some time after. At the lower setting it starts and stops every few minutes, I guess the thermostat keeps turning it off when it heats too much. Not happy at all with this purchase, although it does look nice on the wall. The goods are delivered whole and undamaged. I am very satisfied with the quality. Good luck!